My friends, our reading of Tinkers apparently coincides with President Obama’s own time with the novel. He purchased a copy to read last week while on vacation in Martha’s Vineyard. So we are indeed in distinguished company as we share our thoughts about this one! 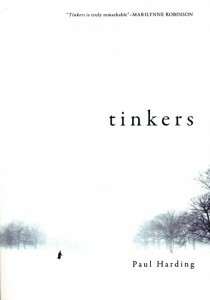 What stands out so prominently for me is that Tinkers is a terrifically vivid novel. The author’s mastery of language and description left me humbled. Although the story consists of simple scenes across several generations of one New England family, the reader is drawn in completely and focuses quite happily on mundane, but captivating details of each character’s daily life. The structure of the novel, as I believe Carrie mentioned in her post, is also unique. I’m sure we’ve each read novels with overlapping storylines – even Colum McCann used this technique in Let the Great World Spin. But Tinkers stands out in that it has near seamless fluidity. It’s as if one character’s consciousness flows into another and then back before the reader has even realized. And it’s not that the structure is confusing –it’s dreamlike. It’s as if the entire novel takes place in that near-waking state where one thought or dream fades into or emerges through the one that preceded it – and it all makes utter sense to us as observers. The fluidity of the storyline also serves to reinforce the connection between the main characters. While most of the novel is devoted to the experiences and recollections of father and son, Howard and George, Howard’s father also emerges for a time, and we, as readers, get an even deeper and multi-generational view of the family. Each of the characters is undoubtedly an individual, but each also exhibits eccentricities that bind them together into a common experience – as tinkers – that spans a century. This entry was posted on Thursday, April 14th, 2011 at 5:16 pm. It is filed under Summer 2010 Books. You can follow any responses to this entry through the RSS 2.0 feed.